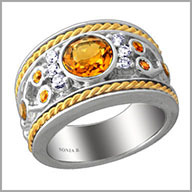 14K Sterling Silver / 14K Gold Citrine & Diamond Ring. 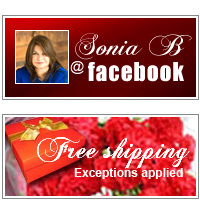 Price includes 30% discount. Crafted in polished sterling silver and 14K yellow gold, this ring glows with one round cut 7mm citrine along with two round cut 3mm and four round cut 2mm citrines. All dazzle in bezel settings. They are lit up with six full round cut diamonds artfully placed in prong settings.The total citrine weight is 1.70ct and the total diamond weight is 0.17ct (both approximate). The diamond color is H-I with a clarity of SI-3. The setting size is 1/2" x 13/16" with a height of 1/8"